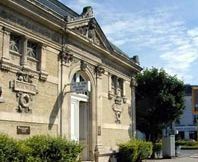 First library built in Reims in 1887, it was renovated in 2002 and 2007 in full compliance with its original architectural style. It offers more than 20,000 books for adults and youth. Founded by Jonathan Holden, wool merchant in Reims, on the occasion of the jubilee of Queen Victoria, it was built by architect Ernest Brunette. Tuesday: 1pm - 6pm, Wednesday 10am - 12pm and 2pm - 6pm, Thursday 4pm - 7pm, Friday 4pm - 6pm, Saturday 10am - 12pm and 2pm - 5pm. Busline 5 direction "Route de Witry" or 8 direction "Bétheny-Mairie", stop "Brouette". There is no review about Holden Library, be the first to leave one !